Joan has found her pig, but we still have a mailing list of people looking for all these Snuzzles Blankies animals from Playskool. 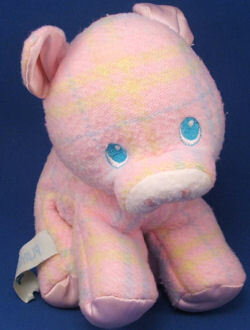 I’m trying to locate the Playskool Snuzzles Blankie pink plaid pig. My daughter was given this as a baby, and she carried Piggy Wig Wig round with her always. Her younger sister lost it, and she was heart broken. Playskool told me they didn’t make them anymore, but now she is pregnant, and I would love to be able to buy the baby a Piggy Wig Wig. I have this plaid playskool pig as well as all of the other animals from the 1980’s collection. I will be listing them on ebay if I do not find appropriate buyers. I have been searching for the lion for years. Let me know if you have it. It is a childhood toy of mine and it would mean so much to me if I could purchase this from you! 20331. I am really interested in either. Have been looking for years. E-mail me at dranzer_26@hotmail.com with the info. This may well be the set mentioned earlier. I do not know. They are all from the same seller. Best of luck to all searching. Thanks, Carrie. They are the ones I’ve already sent.